As a business owner, you know that events represent a great way to promote your business, or honor your employees or donors. 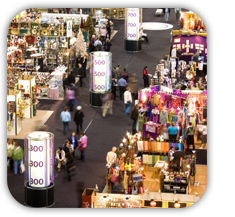 Do you have an upcoming trade show? Are you planning to host a fundraiser or other venture for a charity of your choice? No matter what event you have planned, you know that you can't manage the entire process on your own. Fortunately, Goodkey Show Services Ltd is here to help. Known for trade show event services in Vancouver, Edmonton and across Western Canada, we have the ability and experience to handle a wide range of events. You can count on us for trade show installations, signage, furniture rentals and much more. From the planning and logistics to the decorating and displays, we are here for you every step of the way. At Goodkey Show Services Ltd., you will find a friendly and courteous staff that listens to your needs and desires. Our team of consultants, designers, and event planners works in a timely and professional manner as we schedule, plan, and oversee your event. So don't worry and stress about potential problems at your next event, or trade show—let us handle everything. With almost 20 years of experience in the industry, our owners — Calvin and Rodella Goodkey — has earned an illustrious reputation for their high standards and commitment to customers. When you choose us to plan and supervise your next event, you'll receive nothing short of excellence and professionalism. We provide event planners with the products and services they need for a successful event. We help you with everything from logistics to signage and accessories. Click on our products and services page to learn more about the options available to you, or browse through our gallery pages to see our work for yourself. Visit our blog page for the latest news and trends from our industry. Are you ready to schedule your next big event? 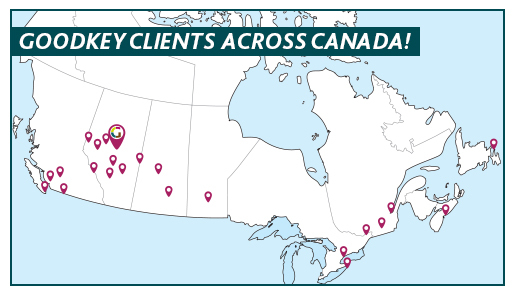 Contact us to schedule or learn more about our trade show event services in Vancouver, Edmonton, Red Deer and throughout Western Canada. We take pride in our ability to reflect your professional image with customized event solutions and exceptional service. We have the capability, equipment, knowledge and expertise to meet any and all of your special event and trade and consumer exhibit requirements. Difficult or demanding venues are our specialty. No show is too big or small. Whether it's a 50 or 500-booth trade show, we deliver on budget, on time, every time. We're a roll-up-the-sleeves kind of operation that's inspired by our owner-manager, Calvin Goodkey. With more than fourteen years of experience, Calvin has earned a reputation for the highest standards in excellence and dedication to customer satisfaction.